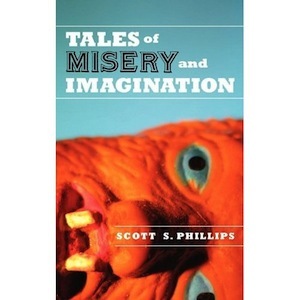 Tales of Misery & Imagination – Now on your iPad! I just got word that my book Tales of Misery and Imagination is now available for the iPad in the iBookstore — there’s no way to link to it, so if you’re interested (and I certainly hope you are), you’ll have to search for it. A collection of short stories by Scott S. Phillips (author of Friday the 13th: Church of the Divine Psychopath and Unsafe On Any Screen), these Tales of Misery and Imagination leap forth from an untamed wilderness of pop culture, insecurity, lust, monsters and misadventure: a disillusioned man is tormented by not-so-random acts of vandalism, sideshow performers ponder their future, confidence is found in the strangest of insults, a shy teenage boy journeys into the undiscovered country of a car full of girls, an embittered boy-band veteran spills his secrets, a quest for Bigfoot goes awry, and heavy rains bring something toothier than flowers into bloom.